The evolution of Pablo Picasso’s artistic styles and forms over the course of his long and fulfilling career provides us with interesting insights into the psyche of the man himself. In other words, Picasso had written his autobiography, not through the medium of words, but rather manifested through his paintings’ sense of the aesthetic. Along with his contemporary Braque, Picasso is credited with the invention of the path-breaking class of visual art that is called Cubism. But this invention is not pre-conceived. Picasso or Braque did not set about radically altering norms of art; rather the circumstances of life of these gentlemen have had a significant effect on the way their minds conceived their paintings. 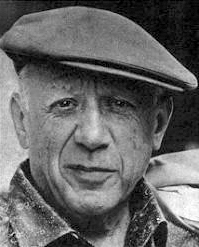 Furthermore, Picasso is famous for the number of self-portraits he did. Hence, the biographical and the artistic are intricately linked (Shaw-Eagle, 1997). The rest of the essay will expand on this theme capture the essence of Cubism through its inventor. It is important to note that his art during the early period indicated signs of things to come. His first cubist painting “The Young Ladies of Avignon” was painted in 1907. Just the previous year, he had painted one of his self-portrait masterpieces “Self-Portrait with Palette”, which was done in his early style. It would be inaccurate to infer that with Cubism, Picasso has made a decisive break from the past. As a matter of fact, when The Young Ladies of Avignon was exhibited in 1907, it wasn’t referred to as Cubism. The term Cubism was assigned retrospectively to an emerging new trend seen in the works of artists such as Picasso and Braque. While Picasso is most famous for his Cubist works, he was also inspired by the works of such artists as Toulouse-Lautrec, Diego Velasquez and El Greco. For instance, his early painting “Lady in Blue,” has elements that are unmistakably that of Velasquez, and is almost satiric impasto portraiture of a Spanish courtesan. So, the range of styles and forms adopted by Picasso is very comprehensive and Cubism is just one chapter in the artist’s body of work (Danto, 1996).